Muslim Restaurant (yes, that’s it’s official name) on Bangrak's historic Charoen Krung Road has been serving up rich and delicious Indian-Thai Muslim fare in a classic, no-frills setting for 70 years. Cheap and basic, but not lacking class. Though it’s changed a lot since becoming Bangkok's first road in the early 1800s, the Charoen Krung of today retains an old-school vibe thanks to its centuries old shophouses peddling Chinese herbs and Buddhist temple supplies, rows of footpath vendors hawking fresh fruit and street food, and numerous hole-in-the-wall eateries serving cheap and authentic fare. 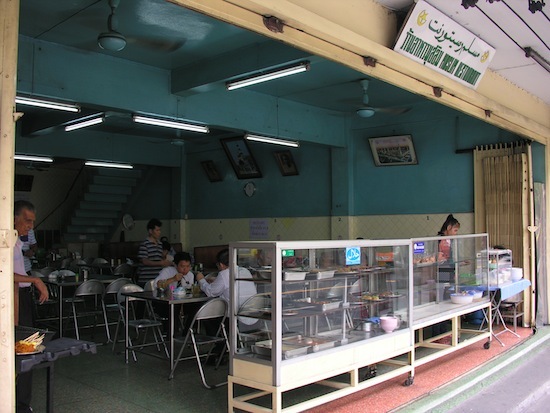 The late original owner of Muslim Restaurant, one of Charoen Krung’s standout eateries, migrated from Southern India in the early 1940s, a time when Thailand was one of the world’s few peaceful countries. Like the original proprietors of Roti Mataba further up the river, Muslim Restaurant’s owner found the local Thais to quickly develop a taste for Indian style curries and yeastless flat breads, or roti. Over time, dishes that had already been around in Thailand for some time — such as gaeng khiao wan (green curry), gaeng massaman, and neua satay (grilled beef skewers) — were added seamlessly into the mix, and today Muslim Restaurant puts out a distinct and delectable blend of Indian-Thai offerings. 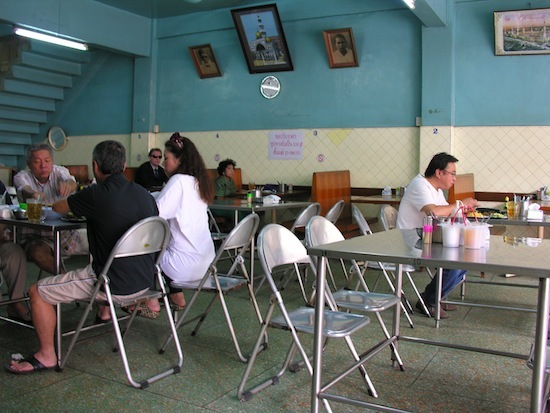 The restaurant sports a utilitarian open-air atmosphere to go with its basic-as-can-be name, but with stainless steel tables and faded photographs of the original owner and his family hung from sky blue walls, it’s a charming place to eat. A snappy team of servers work, including an 80-year-old friend of the original owner who still moves with the best of them. You wouldn’t think stainless steel furniture could be so inviting. The Thai/English menu is strictly Muslim (so no pork), but you can enjoy specialties like goat liver masala or beef brain in curry to go with standards like Thai green curry with beef and stewed chicken. Mataba (chicken or beef stuffed in roti bread), oxtail soup, yoghurts, lassies and coffee are also available. All dishes are reasonably priced from 30 to 130 baht, and most are served on small stainless steel platters. Several of the more popular selections are displayed in a glass case that fronts the restaurant. Less than a minute after we ordered, five small but adequate portions (the food is rich) arrived. 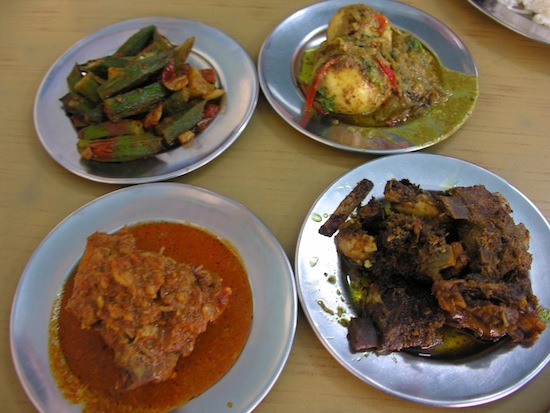 Along with white rice and complimentary sweet cucumber-chilli salad, we dove into chicken curry, boiled egg curry, stir-fried fried okra (labelled only as “fried vegetables” on the menu) and fried mutton (goat). Slow-roasted with a complex array of spices that sneaked up on the tongue, both of the curries were superb, and the softer, earthier flavours and textures of the okra did well to accompany them. With two bulging, peeled hard-boiled eggs slopped onto a platter along with strips of red chilli and basil, the egg curry reminded us of Thai-style choo chee although the sauce was tempered with dry Indian spices. 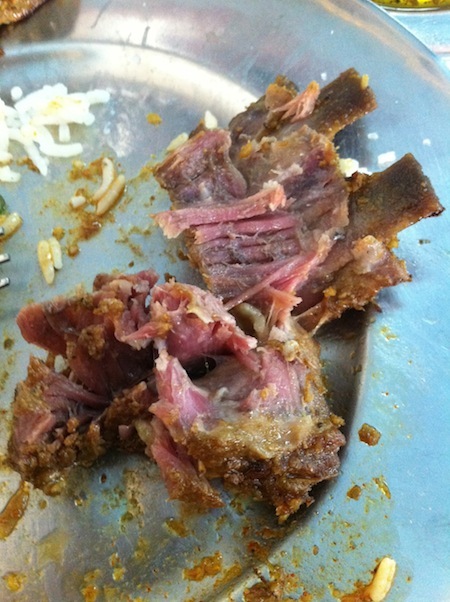 The real standout of the meal however was the fried mutton. Tender hunks of goat on the bone appeared to have been sauteed in oil and a savoury mix of spice after what we would imagine was several hours of roasting. Although the oiliness could be a bit much for some, we loved this dish so much that we took an order (along with a bowl of the massaman) home for dinner. To get here, take the BTS sky train to Saphan Taksin station or the Chao Phraya Express boat to Sathorn pier, and walk east for no more than 100 metres before turning left (north) onto Charoen Krung Road. Walk for about a half kilometre and look for Soi 42 just after the road curves slightly to the left (Silom Road starts to the east at this point), and Muslim Restaurant is just after that soi on the left. There’s no English sign, but you can’t miss the white sign with green Arabic and Thai script along with the restaurant’s sky blue interior walls.